This week discussion of the letter N brought to mind nutting stones, needles, notched points and nets. It was quickly decided that nets and the important role they played in the daily lives of Native peoples would be an interesting topic for our followers. Preserved nets woven from plant fibers date to more than 20,000 years ago in the Old World and we assume they were brought to the New World when humans first arrived over 16,000 years ago. These probably had a variety of functions including carrying goods, hunting and fishing. Nets were reported in detail by early European explorers and a few examples exist in museum collections for the curious to view and appreciate. Prehistoric nets rarely survived the vestiges of time in Pennsylvania because our temperate climate is not conducive to their preservation. 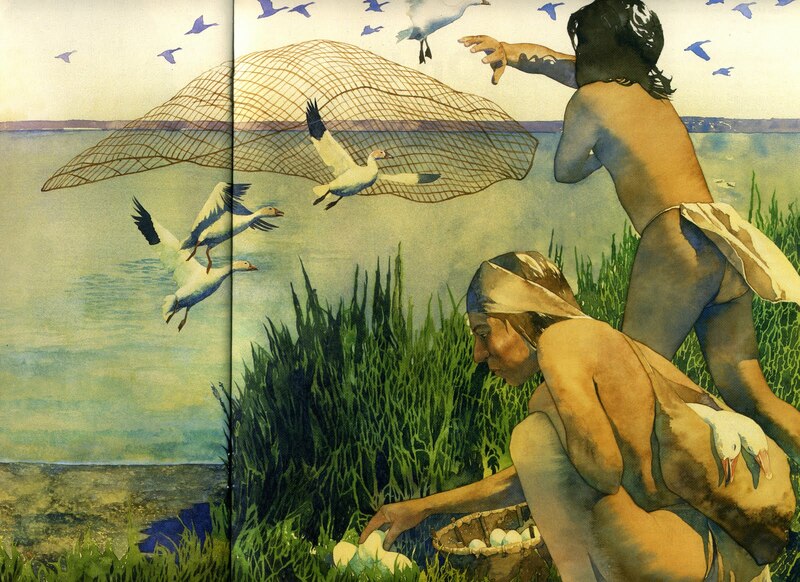 In most cases only secondary evidence remains for the prehistoric use of nets. 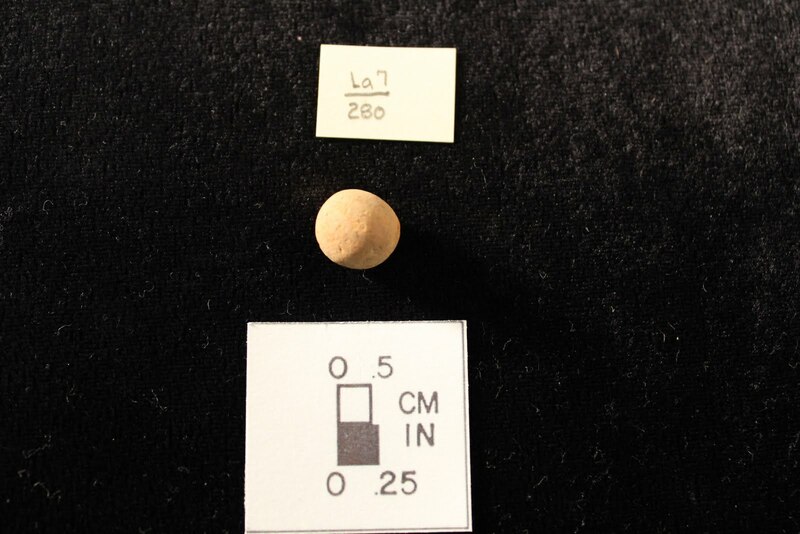 Notched net weights and net impressions on prehistoric pottery are two forms of artifacts that we can use to identify netting technology in a prehistoric context. Typically notched net weights were simple tools and of little consequence to the fisherman (or hunter) if lost in the water. They did not require much energy or skill to make and were easily replaced. 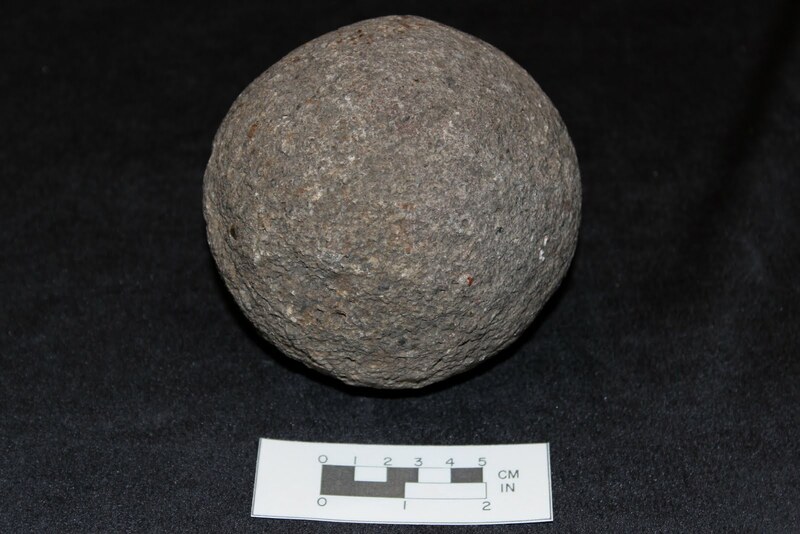 Several caches of net weights have been discovered in Pennsylvania including a large cache of notched net weights discovered on a Susquehanna River island some years ago and reported in TWIPA on (see the earlier TWIPA blog we did on netsinkers for details). One technique archaeologists employ in analyzing prehistoric pottery is to make a negative impression of the net-markings that are present on a pot’s exterior. 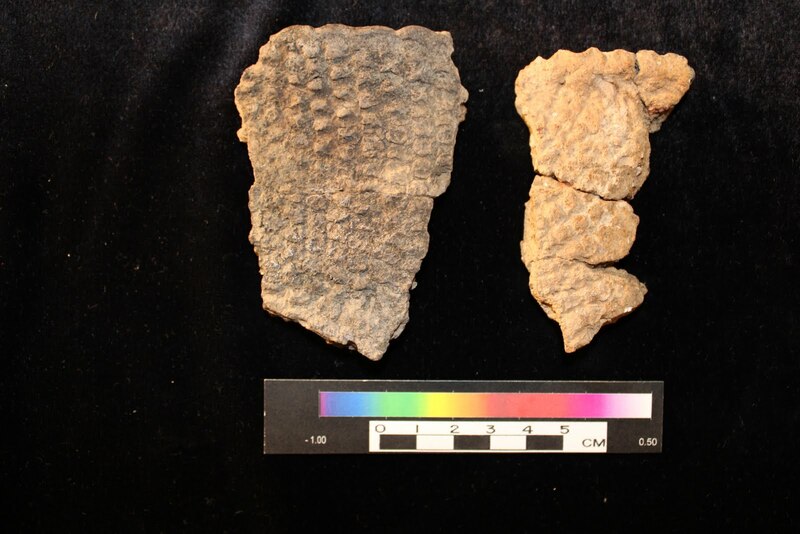 Negative impressions of net on net-marked pottery provides a three dimensional image of the actual net’s composition. The surface of the pottery is carefully covered with latex rubber or some similar viscous casting material available at most craft outlets. The resulting cast, an exact copy of the net that the potter used in decorating the pot can then be measured, photographed and studied to obtain information on prehistoric netting technology (Hurley 1979). Prehistoric nets have been preserved in very dry settings such as in caves of the southwestern United States and when partially burned or charred. These examples demonstrate a surprising level of sophistication. There are two sites in Pennsylvania where nets and related remnants of the prehistoric perishable industry are reported in the archaeological record. The first and most famous site is the Sheep Rock Shelter (36HU1), a large cliff-like shelter located in central Pennsylvania. This site provided favorable conditions for the preservation of numerous perishable artifacts including Native made cordage and netting. Archaeology was conducted at this location prior to its inundation of waters for the Raystown Reservoir. 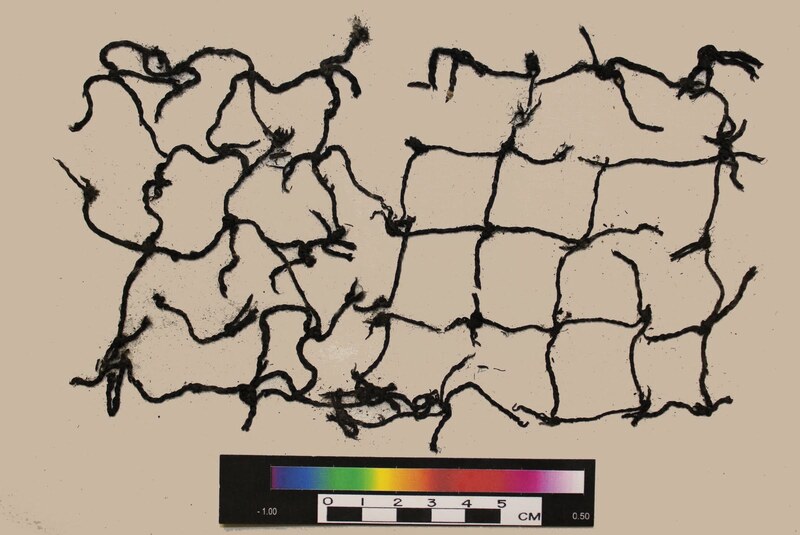 Two specimens of preserved netting are reported, and in both cases the net’s cordage has a final Z-twist pattern with each net cell cross tied with square knots forming knot spacing approximately one inch apart (Willey 1974). There are no radiocarbon dates directly associated with these specimens. 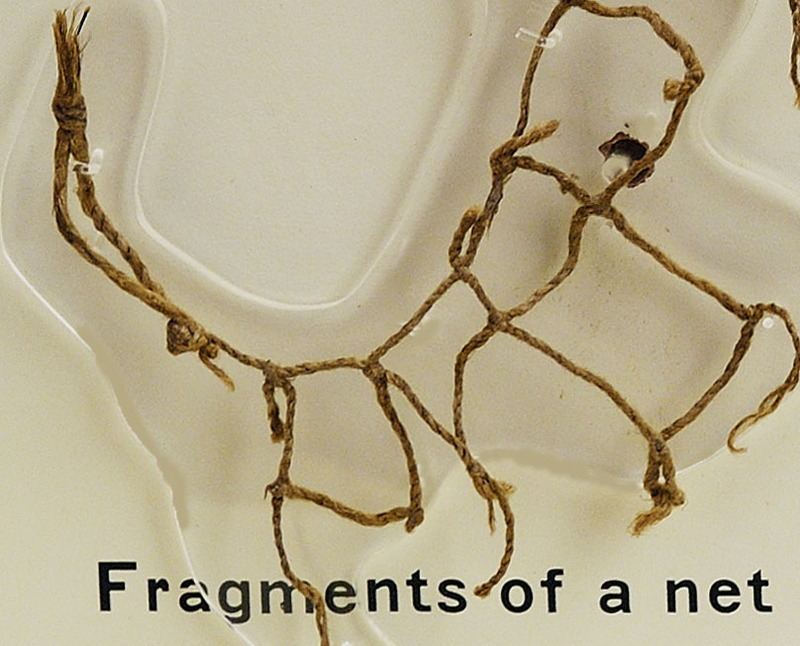 Another well preserved, though carbonized and very fragile, net fragment was excavated from the Late Prehistoric period McFate Site (36CW1) in northwestern Pennsylvania (Schoff n.d.). Unlike the net fragments from Sheep Rock Shelter, the McFate Site specimen is more complete and the knot spacing is slightly greater at one and one eighth inches with the net’s cordage twisted into a final S-twist foundation. Radiocarbon dates place the McFate Site’s Indian occupation around the mid-15th century. Although very rare, perishable artifacts such as nets are tangible evidence of the sophistication of prehistoric societies not evident in the typical stone artifacts of the region. 1979 Prehistoric Cordage: Identification of Impressions on Pottery. Aldine Manuals on Archaeology. Taraxacum. Washington. n.d. McFate Site: Report on Archaeological Excavations Conducted in Northwestern Pennsylvania by the Works progress Administration. Ms. #2 on file, Section of Archaeology, The State Museum of Pennsylvania. 1974 A Functional Analysis of Perishable Artifacts: During the Late Woodland Period in the Northeastern United States. M.A. Thesis, The Pennsylvania State University. After sharing with you Cedar Cliff High School’s archaeology program for last week’s post, we’re picking up again with the alphabetic theme, and find ourselves at the half-way point through our journey, the letter “M”. And a consensus was quickly formed that “M” is for marbles. Kids today would probably look at you as if you were from Mars if you asked them to play a game of marbles. Indeed, there is an inverse relationship between the rise of the video game and the fall of marbles as a child’s game of choice. Chances are, if you grew up with a Nintendo controller in your hand, you never had a favorite “shooter” marble in your pocket. 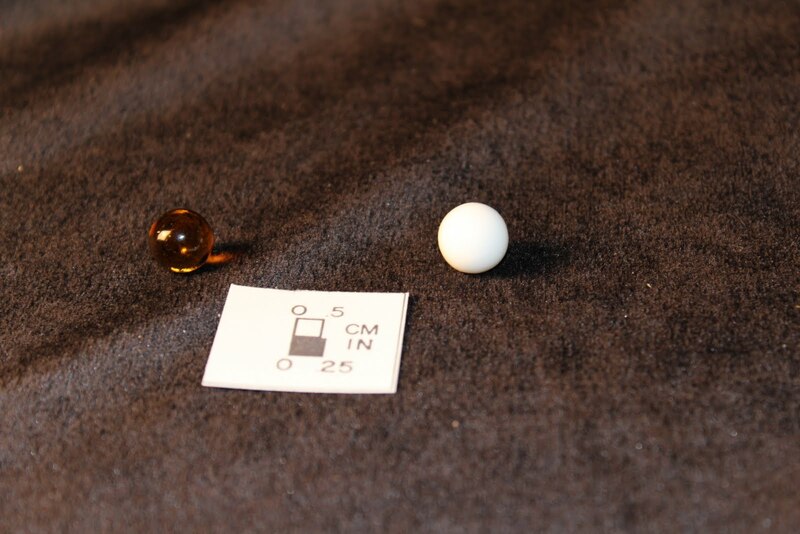 Nevertheless, marbles do show up with some frequency on archaeological sites, both historic and prehistoric, and their presence speaks to not only the enduring popularity of this classic children’s past time game, but to the presence of children themselves, a social group that can easily escape archaeological analysis. As an archaeological specimen, it is fair to say that the marble has largely been overlooked. “Few artifacts within the scope of historical archaeology have been so totally neglected as the marble. There is no valid justification for this neglect, for marbles have perhaps as much potential as chronologically significant artifacts as many other more-studied artifacts, and are much more durable than most” (Randal 1971). 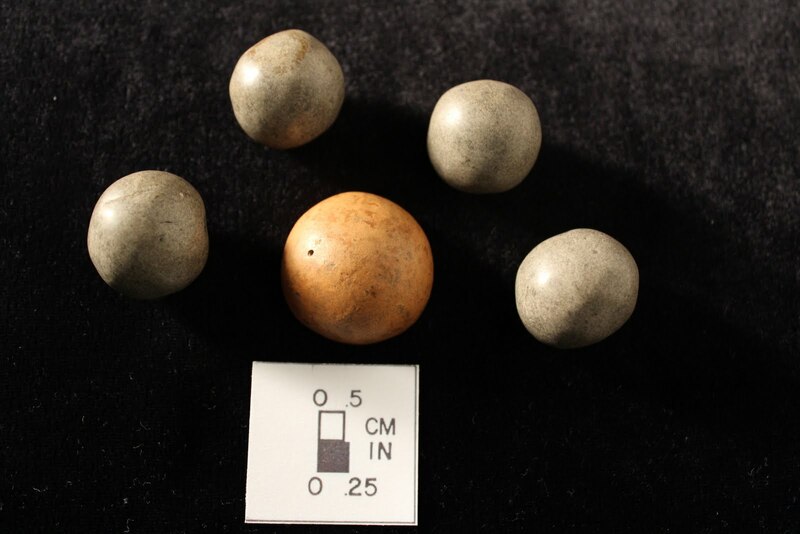 Native American examples of marbles curated by the State Museum’s Section of Archaeology include those made from clay, such as the single clay ball from the Schultz Site, 36La7, seen above, and the stone marbles collected by John Witthoft from Qualla, North Carolina, seen below. 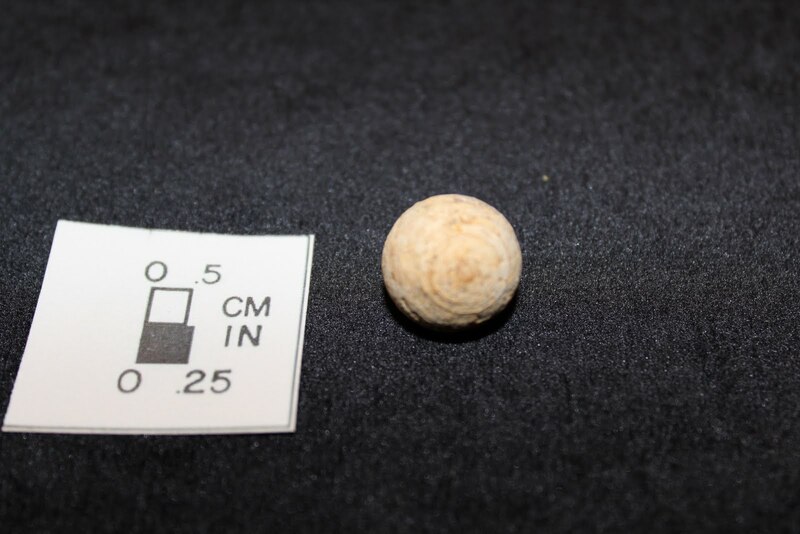 Another specimen, is this stone marble seen here, recovered from the Foley Farm site, 36Gr52. 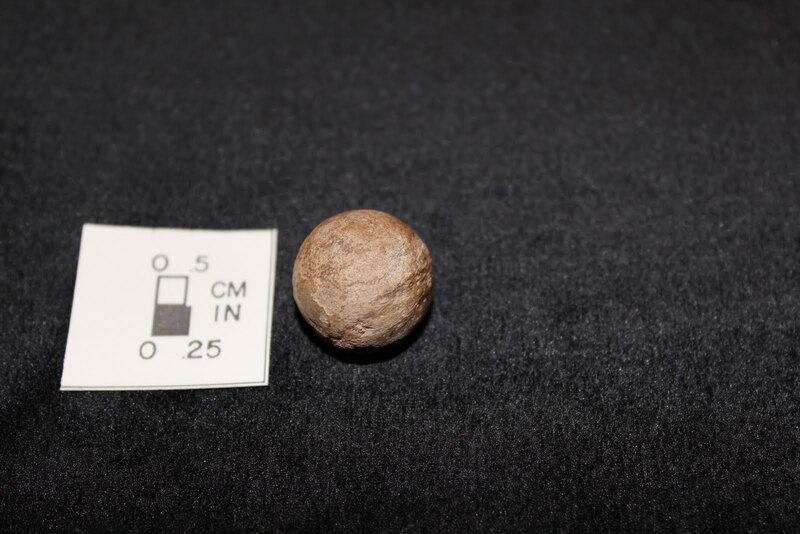 Stretching the typology a bit, a relatively large stone ball, seen here, was recovered from the Wyoming Valley of northeastern Pennsylvania, although to be fair, it probably would not be considered a true marble due to its great size. 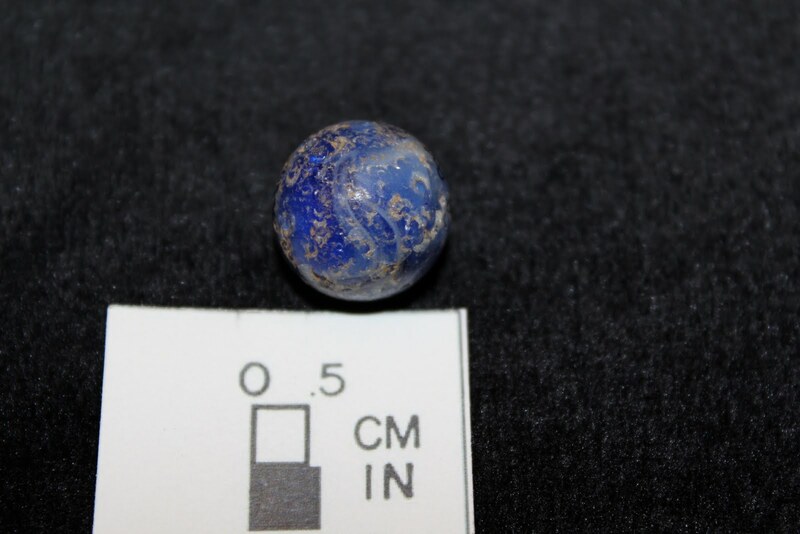 Marbles manufactured in historic times are represented at a number of sites, with an early example made of clay like this one seen here from the Metropolitan Detention Center site in Philadelphia, 36Ph91. Later examples are made of glass in solid colors like these from Washington and Lancaster Counties, seen here. Another example from York County displays a swirl of colbat blue and white opaque milk glass. So when the mood strikes, and the kids are bored with their Playstation, pull out the bag of Grandpa’s marbles, that is if you haven't lost yours! Students can learn about archaeology and archaeological methods in a classroom setting but there is nothing like a hands- on experience. A simulated archaeological excavation can be defined as an experimental project organized by a classroom teacher that has an educational goal of reconstructing human behavior using archaeological techniques (Chiarulli et al. 2000). As part of Mr. Dan Reilly’s AP History class, 27 students at Cedar Cliff High School spent three weeks this May learning and doing archaeology at a simulated site aside the sports stadium. For these students, this experiential learning provides knowledge they can appreciate for a lifetime. 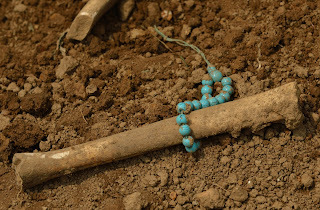 The project began in the early spring, when Mr. Reilly (assisted by several other teachers who were intrigued with the project) created an archaeological site by placing artifacts in the ground. He buried artifacts that represented two different time periods; one historic and one prehistoric. The historic site consisted of four concentrations of bricks aligned in a five meter square representing the four corners of a house and a fifth concentration of bricks representing a fire place. A scattering of broken dishes and small household items were arranged inside the house and a trash pit with larger historic artifacts was created outside the house. The prehistoric site was represented by a fire cracked rock hearth with charcoal and food remains situated next to a pile of flakes from the production of stone tools (the debris created by a modern flint knapping demonstration). In the corner of the site, three burials were placed; not actual human remains, but deer skeletons aligned in a human like fashion – thus creating the “deer people”! Mr. Reilly has experience in compliance archaeology in the United States and he also spent time in Ireland working on a site dating to the medieval age. He was very excited about this project but it required a lot of time and effort on his part. Working with a limited budget for equipment, he received assistance from KCI Technologies, a local Cultural Resource Management Consulting Firm, and The State Museum of Pennsylvania, Section of Archaeology for shovels, trowels, brushes, tapes and screens. He also had to manage a crew of 27 inexperienced students and luckily he received periodic help from Marcia Kodlick at KCI, Dr. Scott Smith at Franklin and Marshall College and Dr. Kurt Carr at The State Museum. Never the less, it was a huge amount of work on his part but one that he feels was well worth the effort in terms of benefit to the students. The students began with several days in the classroom where they were taught the difference between archaeology and paleontology; that archaeology is a subfield of anthropology – the study of human cultures; the nature and significance of stratigraphy; and the importance of archaeological context or the location of the site and the three dimensional location of the artifacts within it. With anticipation, students started to "dig" on a hot day in the 3rd week of May. Field work began with a lesson using a transit to survey and lay out a mapping grid. Archaeology is all about mapping and identifying patterns in artifact distributions. Everything needs to be mapped. This was followed by the students conducting a controlled surface collection and placing flags where they found artifacts. Archaeology is not about the random search for treasure but the systematic recovery of data on how people behaved in the past. Based on the controlled surface collection, nine teams of three students each picked a one meter unit for excavation. Using the principles of the Pythagorean theory (A squared + B squared = C squared), the students placed stakes at the corner of their squares, connected them with string to define the boundaries and began digging. The plowzone was excavated with shovels and the soil was screened. The students had been taught that the artifacts in the plowzone were out of context and did not need to be mapped with the same precision. But, once in the subsoil, they began digging with trowels and brushes. Field work lasted for over a week, eventually exposing two corners of the house foundation, the chipping cluster, half of the hearth, and two “deer people” burials. Field notes were taken to document the location of artifacts and features. In the lab, the artifacts were examined and a report was developed, documenting the methods and the findings. The students enjoyed finding stuff, but they also enjoyed weaving the story of how the artifacts got to this location. Ornaments associated with the "deer people"
The State Museum has been assiting with Mary Pat Evans at Susquehanna High School for over five years on a forensics archaeology project and now another local high school is getting involved in archaeology as a way to enhance the educational experience. Archaeology is a multidisciplinary study and allows teachers to demonstrate basic principles of geology, biology, math, history and anthropology. Simulated archaeological projects can be entertaining to the students but they use archaeological data in multidisciplinary programs to develop students’ critical thinking skills. A simulated archaeological project can demonstrate a systematic approach to scientific discovery. It emphasizes the importance of archaeological context to the discovery of past human behavior over the mere appreciation of artifacts as collectible antiquities. An archaeological field experience for high school students allows teachers to answer the age old question often asked by students when taking science math, etc… – “Why do we have to know this stuff?” This experience leads students to see how other disciplines tie into creating the ‘big picture’ and allows them to understand why all learning is important. L is for lithics, laurentian, Lenape, linguistics, and longhouse but this week it is for Leather. The word leather conjures up many an image in most people’s minds. To a motorcyclist it could be a leather jacket and pants, a cowboy thinks leather saddle and chaps, a young woman might think of a designer leather purse. The leather objects most commonly possessed are the shoes or boots on our feet. Most of us give little thought to the process of obtaining these leather goods and are accustomed to a vast selection from which to choose. 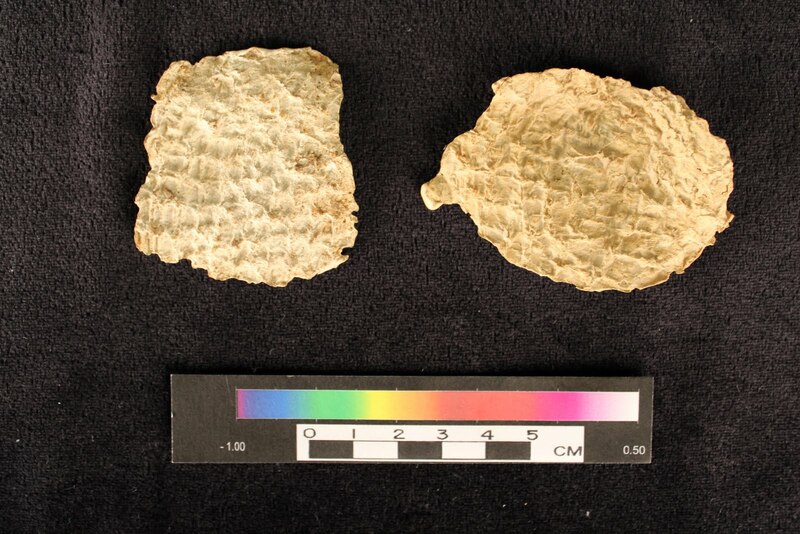 This was not always the case and the tools recovered in archaeological investigations aid archaeologists in understanding how prehistoric peoples processed animals for food and clothing. Ethno-archaeological studies as well as experimental archaeology have increased our understanding of the use of stone tools recovered during excavation. Additionally, specialized micro-wear analysis of edges on stone tools aids in our interpretation of these tools. Hide processing tools recovered from Native American sites date to as early as the Paleo-Indian Period (11150 to 10000 years ago) and consist of several forms, including knives and scrapers. Some of these tools show evidence of hafting for use in a handle which provided leverage and allowed for easier handling. In our culture women have traditionally assumed the role of clothing the family. In prehistory, women were likely responsible for cleaning and processing hides for footwear and clothing. Processing the hide was a multi step progression that required sharp tools to cut the hide away from the carcass and remove the fleshy material attached. This allowed for the initial stretching of the hide and scraping. 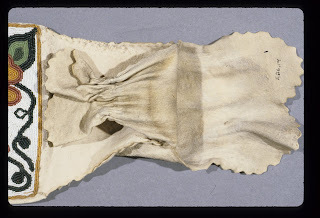 The subsequent stages of processing were labor intensive and involved stretching the hide, then scraping and pounding, soaking the hide in deer brain and washing and stretching again. The final step in the finishing process, smoking the hide, would toughen the soft leather and close the pores making it more durable. 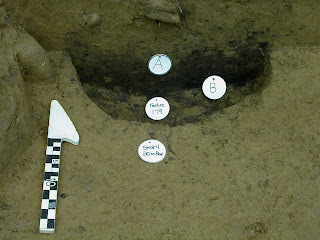 Smoking pits are identified archaeologically as small, slightly oval basins, marked by an upper layer of gray loamy soil were utilized in the final step. Beneath this gray layer, are multiple levels of charred and carbonized plant and vegetable remains. Historic accounts from the 17th and 18th century confirm the use of smoke for tanning of hides. ﻿ ﻿ ﻿ Recent excavations in Tioga County uncovered features identified as smoking pits. Our earliest examples of processed leathers were excavated from the Sheep Rock Shelter site (36Hu1)in Huntingdon County. 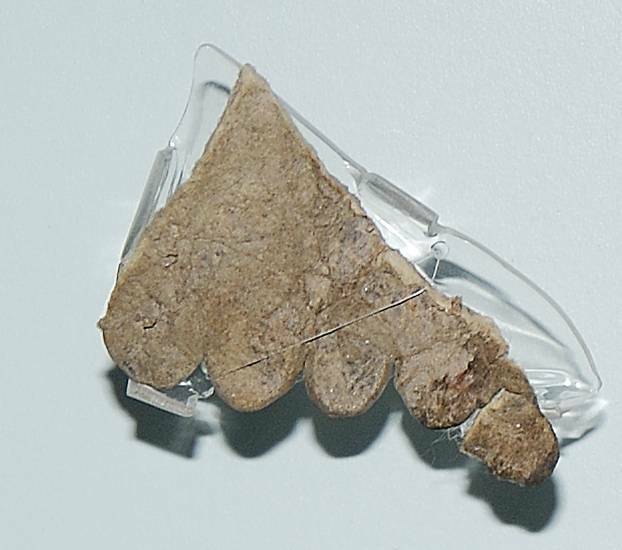 These fragments have been pierced with a sharp tool, likely a bone awl. Bone awls are sharp fragments of splintered bone which were utilized for piercing the hides for sewing into moccasins, pipe bags or garments. The edge of this leather fragment has been pierced to allow a leather string to run thru it to form a bag. 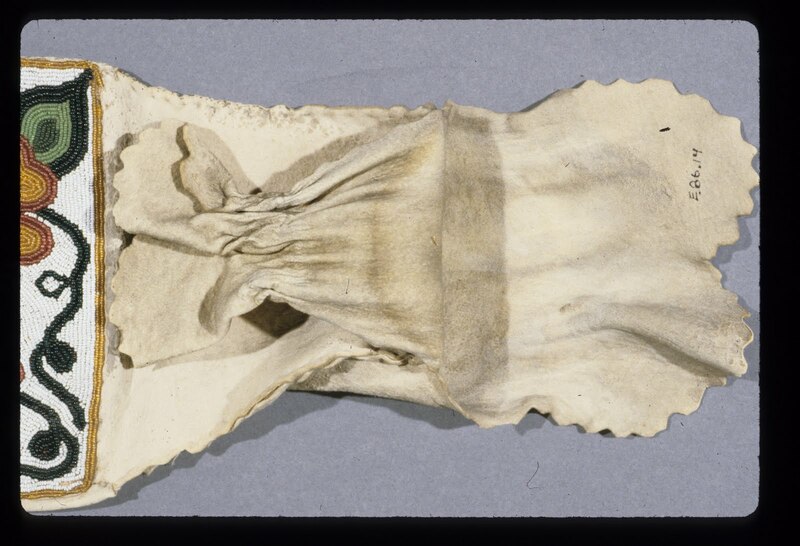 Native peoples utilized leather pouches for multiple purposes including the transporting of food and water. Leather strips recovered from Sheep Rock shelter support their use in creating these pouches. 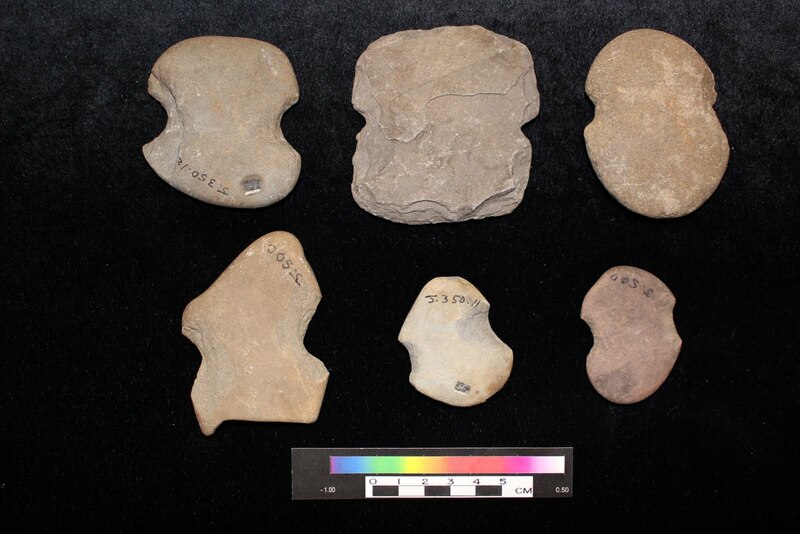 ﻿﻿These fragments from Sheep Rock are identified as moccasins. The construction of moccasins as described in The League of the Iroquois, is one piece of deer-skin. A seam is stitched at the heel and in the front, no seam in the bottom. Plain moccasins rise above the ankle and are fastened with deer strings, then cuffed over the top. 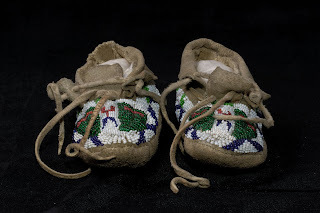 This moccasin is constructed in the same manner as the undecorated moccasin, but the front of the moccasin is decorated with beads. 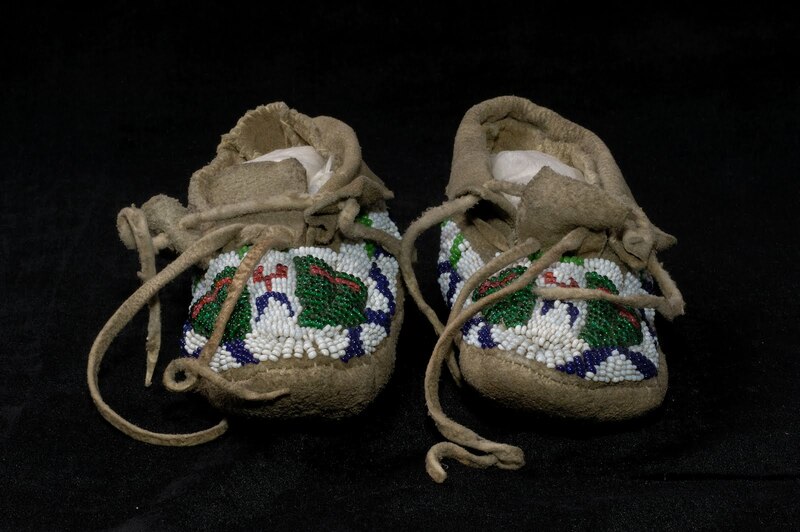 These moccasins were created as tourists trade items and are still popular today. Leather and the tanning process continued to play an important role in the history of Pennsylvania. In 1870 there were 870 tanneries located in Pennsylvania. 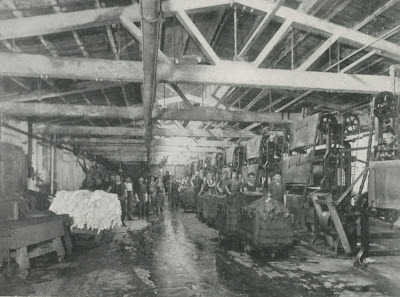 Tioga and Potter counties were part of an extensive region in northern and western Pennsylvania that by 1880 contained the world's largest concentration of leather tanning plants. This was attributed to their location close to the region's rich forest resources, since tanneries were normally dependent on ready supplies of bark, usually obtained from oak or hemlock trees. Because the stately hemlock produced inferior lumber, the wood was frequently left to rot after the tannin containing bark had been removed. These tanneries were primarily producing sole leather for shoes. The introduction of chemicals into the process meant the industry no longer needed an abundant supply of wood to complete the tanning process. Many of these factories closed but tanneries continued to employ several thousand workers into the 20th century. While the tools utilized and processes have changed and evolved since our earliest inhabitants, we continue to desire leather for its quality and durability. Demand for "vintage" leather is high, airfreshner for your car can be purchased to make it smell like new leather, and Forbes magazine reports that the market for luxury Givenchy handbags exceeded expected sales. While cotton may claim to be the "fabric of our lives", we trust leather to stand the test of time.